Published February 10, 2014 at 1500 × 844 in Thurs, 1/30 @ 8:23AM – bird tracks. 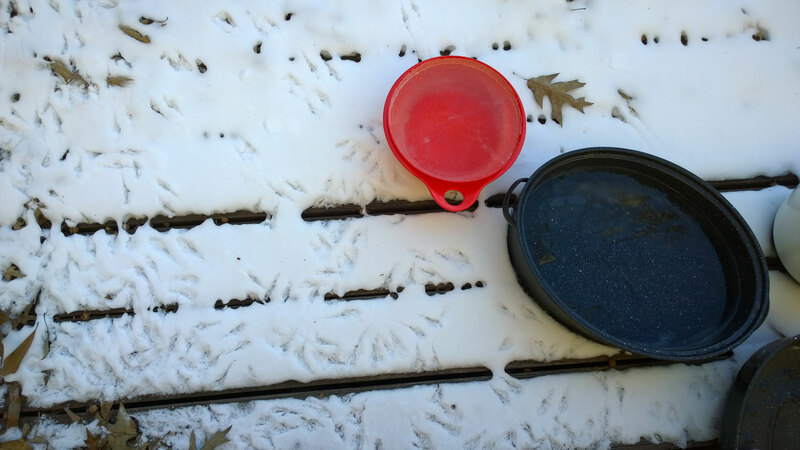 Thurs, 1/30 @ 8:23AM – bird tracks. Kristine filled several containers of water to freeze solid overnight with temps dipping down into the single digits. Apparently, this was a big hit with birds looking for non-frozen water. We find these tracks in the morning and the water frozen thick across the top and mostly around the bottom so that when we flip these over, we have ice bowls of ice water.